Buffy's new position as leader and figurehead of the world's five hundred most powerful women has made her a bigger target than ever before. 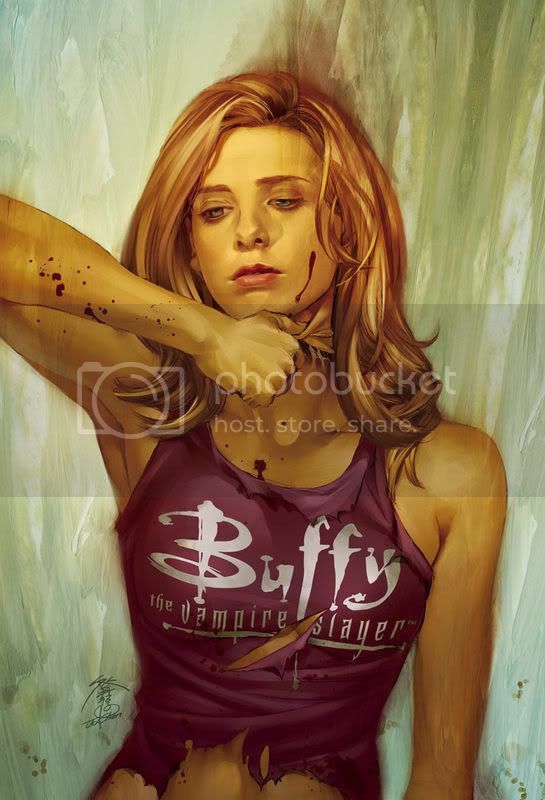 "The Chain" tells the story of one of the decoy "Buffy" Slayers, a tale personally important to series creator Joss Whedon. Guest artist Paul Lee (Conan, Tales of the Vampires) pencils the first standalone issue of Season Eight. It's also 40 pages instead of just 32, yay for skip month! Sounds so cool! It's gunna be great seeing the story of one of the decoy slayers. Can't wait to see the cover. Thanks! OMG!!! I was wondering when they would introduce the decoy. I just hope it isn't too long before we see the cover art for this cover... the other comics for august on dark horse do not have the art up so hopefully it is up in the next few days. "a tale personally important to series creator Joss Whedon..."
Hmmm...would be nice to have an emotion issue for a change. Been pretty lighthearted so far. Gotta break up the funny from time to time. This looks like it will be intense. Those are all so amazing. Where did you find them? 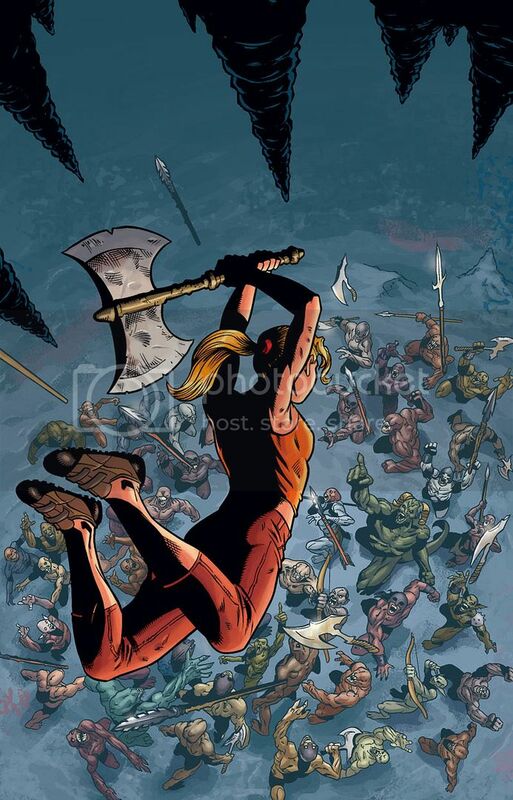 Dark Horse put up the Jo Chen cover and Comic Book Resources put up the others. Thanks to the good folks over at Whedonesque. Bump, just so people will see this. Awesome! the covers for this issue are sooo AMAZING! ah! i can't wait! this just looks awesome!! i can't wait! The preview is STILL not up! UNless they added it in the last 4 hours. There is a Paul Lee interview with some details and art! do you think Season 8's creative team (and the writing staff) will be at comic con in san diego? they might spill some spoilers, plus - publicity, always good. 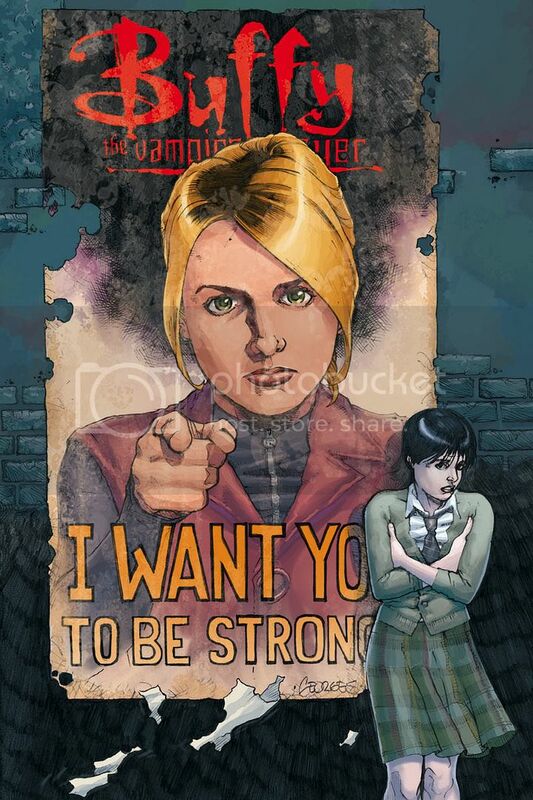 I wonder if buffy (the real one) will appear in this issue at all or do you think that it will just be giles and andrew giving orders to the slayers??? Also, i wonder which slayers are fighting off that vamp??? In the issue 4 comic, it says that if this were an episode in the television series, joss would have directed it.... i am assuming by this comment that the issue wud be able to last 45 minutes if aired on tv, meaning more violence scenes...maybe??? Also, does anybody else just see the demon being floored as the gnarl and also the slayer that is fighting it off has a slight kill bill uma thurman look?!?!?!? Way cool, thanks for posting the article hitnrun. One of the demons looks kinda "first-evil-y". Probably not it though. I'm really looking forward to this issue. Kinda most of all! The plot is very intriguing to me, and I am sure that it will have a grim ending. As far as I'm concerned we need a little bit of drama right now. I wonder if the last sequence he was talking about ends with Buffy receiving a phone call that the decoy has died? Maybe he had a hard time showing Buffy's reaction to this news...? The first Wednesday of the month. If only this wasn't a skip month! This is brutal. As much as it hurts, its actually better for me. I haven't gotten aroun to pre-ordering the issue yet.